One of the most challenging aspects of my work is surmounting the communication challenges created when B.F. Skinner and others referred to their laboratory method of altering animals’ behavior as “behaviorism” and themselves as “animal behaviorists.” This left all those who were studying animal behavior in the animals’ natural environments without the words to describe the work generations of them had used for years. History is vague as to why those in the latter group chose to adopt the nearly incomprehensible term “ethology” instead making a fuss about this misappropriation of terminology. Perhaps it had something to do with their awareness of the role energy-efficiency plays in animal behavior. They may have decided that fighting to retain the terminology wasn’t worth the energy because behaviorism was primarily a United States approach at that time. However, because the bulk of my clients do live in the United States where behaviorism reigns, I find myself explaining the differences between the two repeatedly. I’d like to take credit for figuring out these basics on my own. But I owe much of my understanding to veterinary ethologists worldwide who would patiently explain these differences when my veterinary education caused me to automatically slip back into the problem-oriented mode. I remain forever grateful to these mentors who gently, but firmly pointed out the error of my ways. One difference between behaviorism as it’s often practiced in training and ethology may be summed up like this. Behaviorism is problem-oriented and ethology is animal behavior-oriented. Thus, a person trained in behaviorism will think in terms of the dog’s aggression or separation anxiety, or the cat’s inappropriate elimination or vocalizing. These are the problems that must be fixed using reward, punishment, and/or drugs. Meanwhile, the ethologist will look at those same behaviors and see these as indicative of what the animal must do to achieve the maximum amount of physical and mental stability in the environments in which the behaviors occur. Put another way, these behaviors don’t represent problems, but rather normal behavior for that animal under those circumstances. If you’re like me when this was patiently explained to me the first time, you’re probably thinking that this either is the most reasonable — and elegant — description of what the animal is doing you’ve ever heard… or the biggest batch of hogwash. And in fact, a fair number of my clients feel that way at first, too. But generally my clients fall into one of two groups. One group consists of clients veterinarians referred because behaviorism plus drugs didn’t work for some reason. Those in the second group heard about me from a former client who apparently described me as some sort of St. Jude for hopeless animal behavior cases. While the latter title is somewhat embarrassing, both groups often are more open to thinking outside the box. Because ethology takes a more ecological view of the animal’s behavior, recognizing that their animals’ behavior is normal under the existing circumstances can have a positive emotional effect on clients. If they’ve had any doubts that their animals had problems — and few of them do—there’s no shortage of others who have made this clear to them. As a result, they often feel like failures and believe that their animals are failure, too. This is not the kind of mindset that enables clients to communicate the kind of trust and confidence their animals need to relax! Another ethology basic deals with energy utilization. In a nutshell, evolution rewards those who get the job done using the least amount of energy. Thus, the less energy a dog puts into her responses when another dog goes by or someone rings the doorbell, the more fit that dog is. But within the problem-oriented behavior mindset, the more energy she expends, the more hell-bent she is on taking on that other dog or person and — I shudder to use the words — the more dominant or alpha she is. 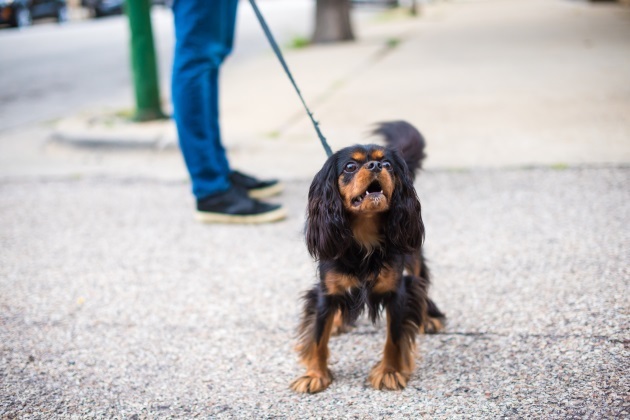 When we consider the latter pronouncement in the context of the physical, mental, and emotional environment in which the dog and owners live, the latter take on the dog’s behavior may spell the end of the relationship. Convinced that there is no hope for an animal that goes berserk every time she sees another dog or hears the doorbell ring, euthanasia may seem like the only viable and responsible option. On the other hand, if we analyze those same displays in terms of context and energy consumption, a different pictures emerges. Aggression is an energy-intense activity. Consequently, expending a lot of energy growling, snarling, lunging, and otherwise carrying is only a viable strategy in two situations. In the first, the animal makes such displays when protected by the car, living room windows, doors, or fence. The history in these situations reveals that the owners (usually inadvertently) have communicated to the animal that they expect the animal to protect them and their property. This creates a conflict for naturally more subordinate dogs. On the one hand, these dogs have no desire to fight and get hurt. On the other, they need to protect the owner and themselves if for no other reason than that they’re dependent on that person for food and shelter. In this scenario, the most energy-efficient response in terms of canine safety is for the animal to mount an owner-pleasing high-energy protective response from behind the safety of some barrier. Relative to the probability of resolving these problems, the good news is that the amount of energy these animals use tells us that these animals are stressed. Consequently and contrary to some conventional training wisdom, these animals will be more amenable to consistent owner cues that such displays are unnecessary. Compare this to the protective dog who expends minimal energy when potential threats to his territory arise. Because these animals are more confident and their aggressive displays cost them so much less, they have less to gain by giving them up. Failure to recognize these differences in energy utilization may lead to a challenging communication and behavioral paradox that may arise in multiple dog households. More on that next month.